Blight removal in Detroit isn’t impossible, but it is difficult. It was never written into the business plan, but persistence won the day for one of the most complicated redevelopment projects ever attempted in a city desperate to remove blight by almost any means necessary. As Detroit’s civic and corporate leaders move forward on cleaning and remediating thousands of abandoned structures and lots spread across 139 square miles, Henry Ford Health System and the Detroit Medical Center, along with Cardinal Health in Romulus, were eager to contribute to the effort. But it wasn’t easy. The two hospital organizations let out bids in 2011 for a 275,000-square-foot medical equipment, pharmaceutical distribution, and warehouse facility on a 17.5-acre site that, over the last 130 years, had been subdivided into a mixture of 98 parcels made up of factories, fuel storage operations, a rail yard, paint shops, commercial structures, and dozens of single-family homes. The $30-million project, located across West Grand Boulevard from Henry Ford Hospital, is the first phase of a 300-acre revitalization effort by Henry Ford Health System, DMC, Wayne State University, Cardinal Health, and others. The goal is to draw medical uses, R&D labs, distribution facilities, and light assembly centers for medical equipment to an area largely overrun by blight. “With Cardinal Health as our first tenant, we believe this development will transform the neighborhood and stir future economic growth in the city,” says Jim O’Conner, vice president of Henry Ford’s supply chain management, who helped direct the effort in partnership with Donald Groth, DMC’s corporate vice president of materials resource management. Both entities were eager to establish their primary medical supply vendor in Detroit. Working with CBRE on various real estate issues, bids to redevelop the site — a 30-square-block area bounded by Rose Parks, Marquette, Commonwealth, and a series of railroad tracks — were released. 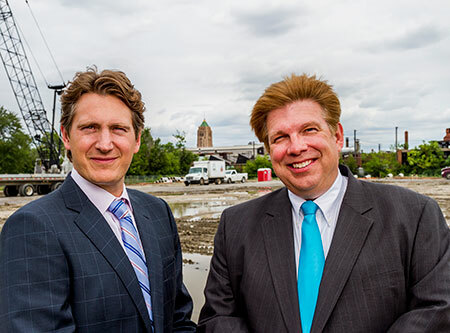 Kirco, a commercial real estate firm in Troy, working with ElmTree Net Lease Fund II, AKT Peerless, and Kirco Manix Urban Construction, were selected to acquire, remediate, and redevelop the site. The new facility, expected to create 140 jobs when Cardinal Health relocates from Romulus, is on schedule to open next summer. Along the way, the development team was attacked by pit bulls, spent months tracking down absentee land owners and relocating residents, uncovered a vehicle chop shop that the Detroit Police Department raided, discovered 11 underground storage tanks (city records showed four tanks), and prepared and finalized more than 200 legal agreements. $500,000 — much more than had been anticipated. Under the final plan, the MDEQ approved the installation of an environmental vapor barrier below the building site to ensure a clean working environment for the future workers. “You had all of these elements pushing and pulling on the project; it was like a movie with a lot of plot shifts,” Kiriluk says. “We were counting on $27 million in new market tax incentives for the project, but it never materialized, and three times we were turned down for a $1 million CRP (Community Revitalization Program) grant from the Michigan Economic Development Corp. (via the Michigan Strategic Fund) because we didn’t meet the criteria, which up to that time had centered on urban redevelopments, which was interpreted as a downtown district. Investors, partners, and facilitators of the project included the Detroit Wayne County Port Authority, the Wayne County Brownfield Redevelopment Authority, the MDEQ, the EPA, the Michigan Land Bank Fast Track Authority, Wayne County, the Detroit City Council, the Detroit Planning Department, Detroit Economic Growth Corp., the Detroit Brownfield Redevelopment Authority, and the Michigan Strategic Fund, among others.